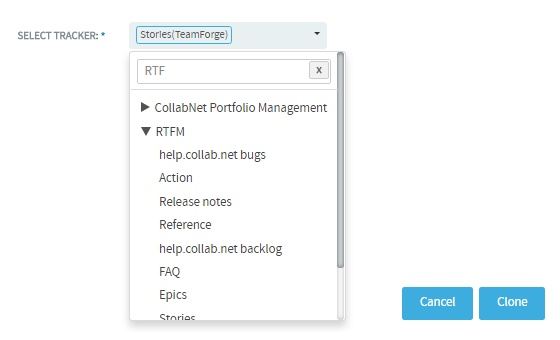 You can now clone an artifact from one tracker to another within the project or across projects. For system defined mandatory fields, artifact data are copied from the source tracker to the target tracker as long as the fields are available on both the source and target trackers. Values for any conflicting fields are set to "None" otherwise. Open the tracker to select the artifact that you want to clone. The View Artifact page appears. Click Select Tracker drop-down list and select the target tracker. You can either select a tracker from within the project in context or search and select a tracker from a different project. 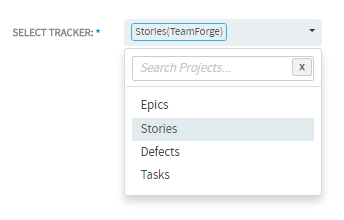 Use the Search Projects text box to find the project that has the target tracker and select the tracker. Click Clone. The Submit Artifact page appears. 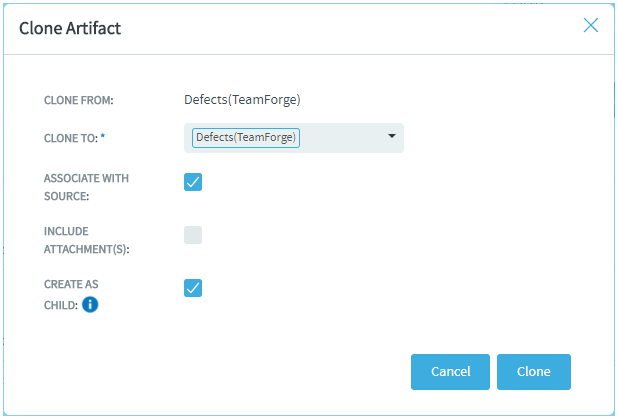 For system defined mandatory fields, artifact data are copied from the source tracker to the target tracker as long as the fields are available on both the source and target trackers. Values for any conflicting fields are set to "None" otherwise.